Simple Oven Fried Biscuits are comfort food at its best! Once you discover how simple and delicious this recipe is you’ll be making them all of the time, you might even put that little doughboy out of work. A delicious, slightly tangy biscuit that is light and fluffy on the inside, firm and brown on the outside, with a scrumptious crispy bottom. Serve for breakfast with some sausage gravy or whip up a batch to serve with dinner. This recipe is ridiculously simple to make. My husbands grandmother taught me how to make them back when we were first married and I have been making them ever since. I recently realized, when I was putting together my weekly budget friendly meal plan that I have never shared her biscuit recipe. I’m really surprised that I haven’t because I make them all of the time. What makes her biscuits so amazing is not just the love that she put into them but how simple and inexpensive they are to make. My family can’t get enough of them. 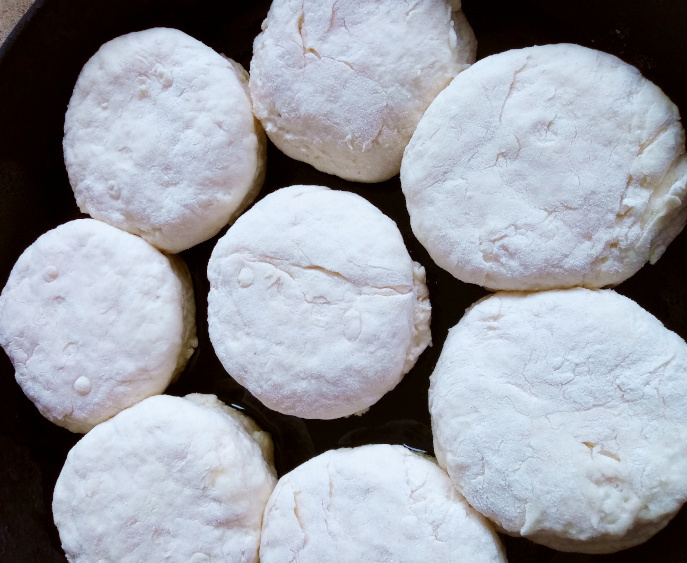 ▪ Flour: Self-rising flour, this is what makes these biscuits so darn easy. We’re lucky enough to be able to buy self-rising flour at the store, but grandma use to make it herself, in bulk, probably because she served biscuits at almost every meal. ▪ Fat: I’ve seen grandma use all kinds of different types of fat in her biscuits, lard, bacon fat, shortening. I prefer using shortening, but I have to say the bacon fat does add a really good flavor to the biscuits. Step 1: Preheat oven to 450°F. Place 2 tablespoons of shortening in a 12-inch cast iron skillet. Place the pan in the very bottom of the oven for 5 minutes. Step 2: In a large bowl, combine 3 cups of self-rising flour and 1/4 cup of shortening. Using a pastry cutter and working as fast as possible, combine until mixture looks like crumbs. Step 3: Make a well in the center and add the cold buttermilk. Stir just until the dough comes together. Over working the dough will cause the biscuits to become tough. Step 4: Lightly sprinkle the top of the dough with flour. Dip a 2-inch biscuit cutter in flour and using the sides of the bowl cut out the biscuit. Place in hot pan. Step 5: Place pan directly on the bottom of the oven, bake for 10 minutes. Move pan to the center rack of the oven and bake an additional 10-15 minutes or until the tops become golden brown. For a more buttery flavored biscuit cut in 4 tablespoon of cold butter into the flour before adding the liquid. 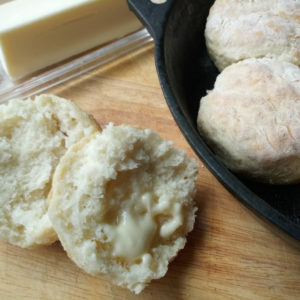 For non-buttermilk biscuits, replace the buttermilk with milk. Milk is considerably thinner than buttermilk so you won’t need to use as much. For cheddar bay biscuits: add 1 tablespoon of garlic powder, 1 tablespoon fresh chopped parsley, 4 teaspoons of sugar, 1 1/2 teaspoons of Old Bay seasoning, 1 1/2 cup sharp cheddar cheese, 1/2 cup cold cubed butter. Cut the butter into the flour before adding the other ingredients. These biscuits can be served any time of day. They are great with a little jam, or topped with egg, cheese and sausage, for breakfast. For lunch, they can be topped with your favorite deli meat, some cheese and a little mustard. And of course, for dinner, they are amazing with just a bit of melted butter or used for soaking up gravy. Not that there will be any leftover, but in case there are place them in an air-tight container or a Ziploc bag. They will keep for about 2-3 days. 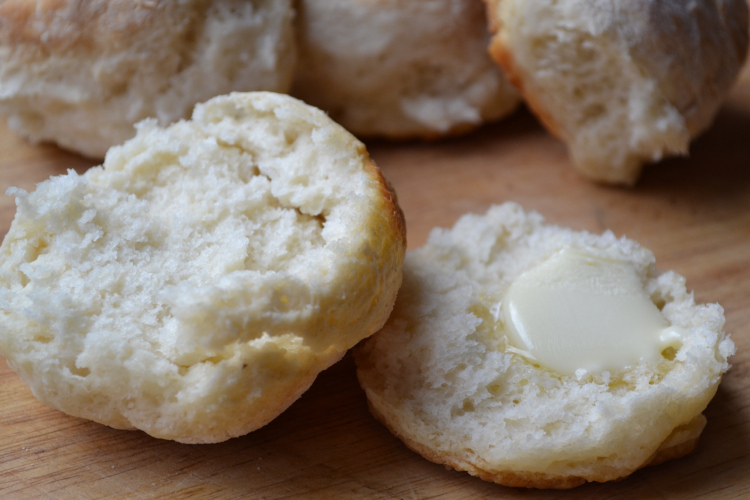 What is your favorite way to eat buttermilk biscuits? A simple, delicious, slightly tangy biscuit that is light and fluffy on the inside, firm and brown on the outside, with a scrumptious crispy bottom. Preheat oven to 450°F. Place 2 tablespoons of shortening in a 12-inch cast iron skillet. Place the pan in the very bottom of the oven for 5 minutes. In a large bowl, combine 3 cups of self-rising flour and ¼ cup of shortening. Using a pastry cutter and working as fast as possible, combine until mixture looks like crumbs. Make a well in the center and add the cold buttermilk. Stir just until the dough comes together. Over working the dough will cause the biscuits to become tough. Lightly sprinkle the top of the dough with flour. Dip a 2-inch biscuit cutter in flour and using the sides of the bowl cut out the biscuit. Place in hot pan. Place pan directly on the bottom of the oven, bake for 10 minutes. Move pan to the center rack of the oven and bake an additional 10-15 minutes or until the tops become golden brown. ✔ How to Make Self-Rising Flour: In a small bowl thoroughly whisk together, 1 cup of all-purpose flour, 1 1/2 teaspoons of baking powder and 1/4 teaspoon of salt. Make it in bulk to use it in your favorite southern recipes or recipes that call for self-rising flour. ✔ How to Make Buttermilk: In a small bowl mix together 1 cup of milk and 1 tablespoon of lemon juice or vinegar. Use the thickened milk and curds just like you would buttermilk. ✔ To brown the tops of the biscuits brush with a little melted butter. ✔ Avoid overworking the dough it will lead to your biscuits being tough. Robin, I’m a biscuit fan from way back, and this is a new one on me! Next time I make biscuits I’ll have to try your grandma’s “fried” method! If you like biscuits, you’ll definitely love this one. Anyone who has had them always asks for the recipe. As you may know, I love vintage recipes! I had a Grandma Ruby too, although I never had the chance to meet her as she died four years before I was born. Your husband’s grandma’s recipe looks delicious, Robin. 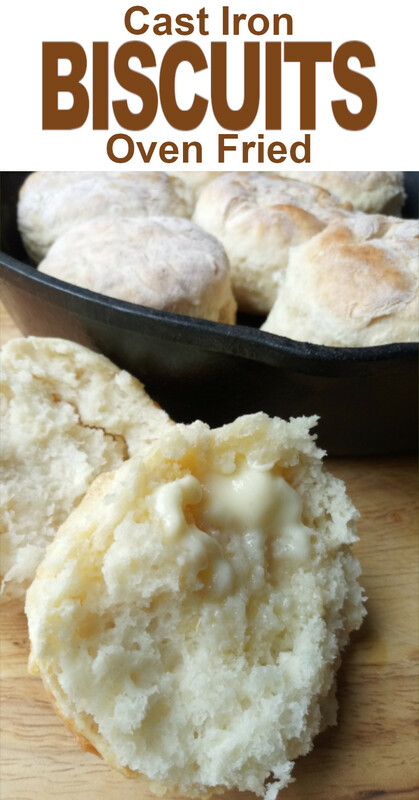 There’s something so wonderful about good homemade biscuits! Thank you for your support of the Hearth and Soul Link Party. The sound great! I can’t wait to try this recipe! Love me a good biscuit! Thank you so much for sharing this great biscuit recipe at #omhgww. It is definitely something that we all need to have on hand. Your Buttermilk Biscuits look amazing! Hope you have a very special holiday and thanks so much for sharing with us at Full Plate Thursday.